When the first Tron film was released in 1982, no one was quite sure what to expect. The concept seemed strange and futuristic, and it was unlike any other movie made before it. Now, nearly 30 years later, we are on the brink of a new generation of Tron. The long-awaited sequel will soon hit theaters, much to the delight of fans around the world. Along with the anticipation and fanfare that come with the release of a beloved sci-fi movie, the Tron inspiration has been flowing with designers. Whether inspired by the classic or the sequel, these Tron-inspired designs are delightful, geeky fun. 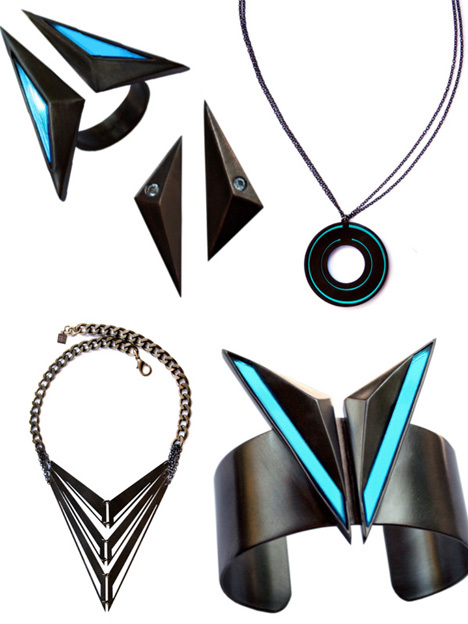 LA-based jewelry makers TomTom partnered with Disney to put out this limited-edition line of Tron: Legacy jewelry. The pieces are grown-up, technology-inspired, and completely perfect for the geeky jewelry lover with deep pockets: they start at $255 and go all the way up to $495. This concept watch from Scott Galloway is Tron tech at its best: simple lines, glowing lights, and geeky goodness all rolled up into a wearable object. Scott submitted this design to wacky watch designer TokyoFlash for a Tron-inspired watch design contest, with the prize being the professional production of the design. 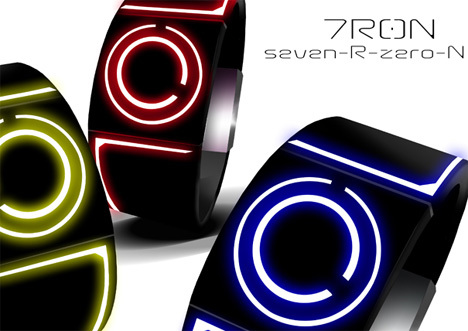 It would be great to see the Tron fans of the world walking around with these gorgeous streamlined timepieces on. 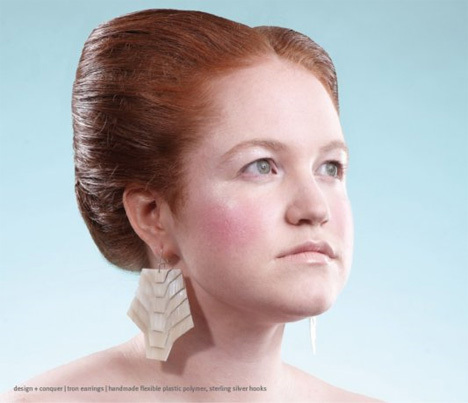 Tron fashion goes high-style with Design + Conquer‘s Tron earrings. The earrings are made from a flexible polymer so they aren’t too heavy to wear. This design is just one of D + C’s delightfully geeky jewelry pieces; their other inspirations include The Neverending Story and Star Wars. 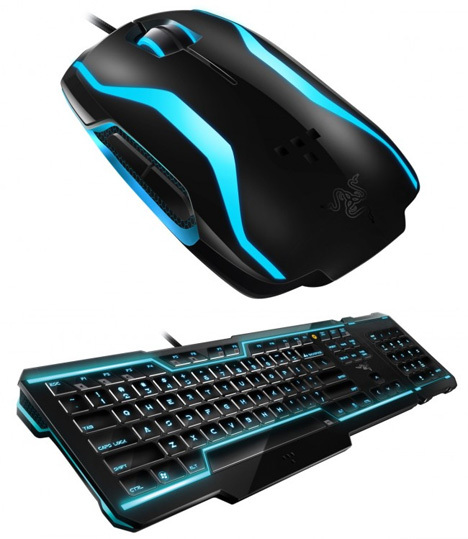 Gaming hardware geniuses Razer have teamed up with Disney to release a suite of sweet Tron gaming accessories, including a mouse, keyboard and mouse pad (not pictured). The keyboard features a detachable numeric keypad for racing around on your virtual lightcycle unhindered. The gaming mouse gives light and sound signals in reaction to your gaming experiences while the mouse mat displays a glow trail that tracks the mouse’s movement across it. Rarely has a DIY Halloween costume been this eye-catching and unforgettable. 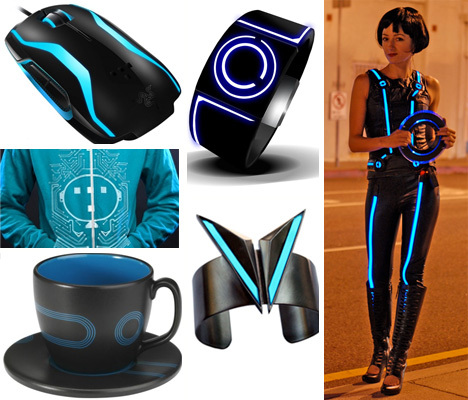 This Quorra costume made by brilliant designer Syuzi captures the tough beauty of Tron: Legacy’s lovely heroine. Syuzi created this totally rad costume using faux leather clothing and electroluminescent tape. Rolf Nelson’s “My Other Ride is a Light Cycle” designs won a huge amount of admiration on Threadless, and he was rewarded by seeing his shirts go into production. 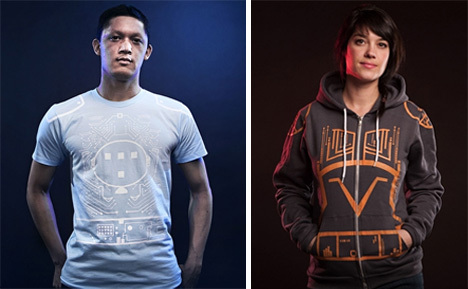 The glow in the dark T-shirt and hoodie designs are what every fashionable geek is wearing this season. These prototype shoes were the result of a combined Disney/Adidas effort to drum up even more enthusiasm for the upcoming Tron sequel. 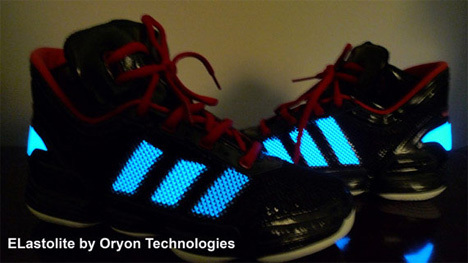 The shoes were made with a type of electroluminescent technology patented by Oryon Technologies that is printed directly onto the textiles and is somewhat washable (up to 25 cycles). It doesn’t appear that these shoes went into production so we probably won’t be seeing them in stores anytime soon. 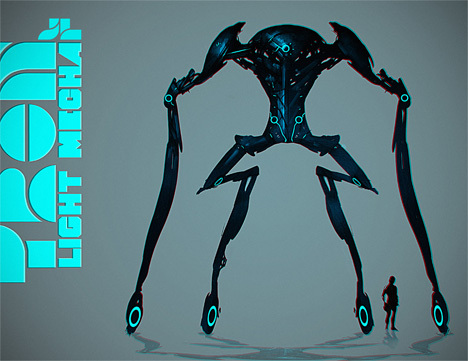 This Tron-syle mecha from Jorge Lacera is what fan art is all about. Lacera used the new movie as inspiration for his totally unique dreamed-up illustration, in which a folding mecha towers over a Program. The artist envisions the mecha folding up origami-style to race around the digital world. 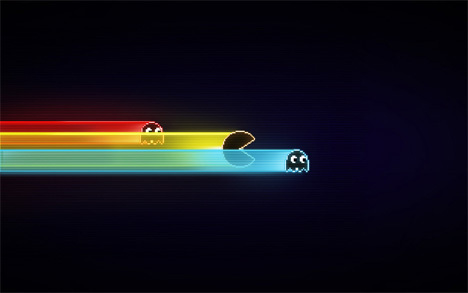 This wallpaper design is a combination of Tron and Pac-Man, which is just too wonderfully geeky to pass over. The Pac-Tron desktop wallpaper was designed by Pixel Fantasy, and it’s everything you would hope for from a mash-up of two geek icons. Finally, a possibly-accidental Tron design. 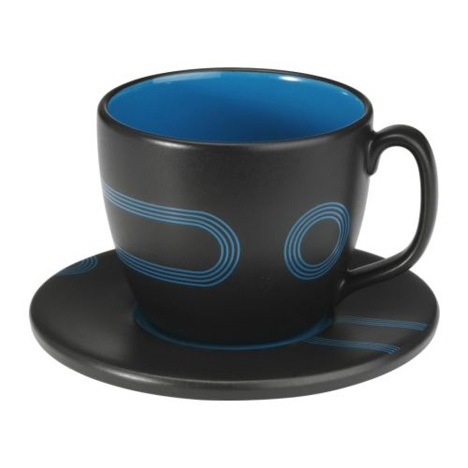 The Sorla teacup and saucer design from Ikea comes in red and blue and sure does look like it was based on Tron-like aesthetics. Whether the designer behind these cups was a fan or it’s just a happy accident, these cups would be the perfect way to start every day before heading out into the digital wilderness.